Microsoft and Autodesk have this week unveiled a new demonstration of the Autodesk MotionBuilder application, which when combined with Microsoft’s HoloLens augmented reality headset allows designers and artists to create their characters in reality. Check out the five-minute demonstration below to see how HoloLens, the VR and AG headset which is currently under development by Microsoft, could transform the way the game characters and immersive scenes are created providing a futuristic way to bring their imagination to life. Jasper Brekelmans explains more about the new augmented reality functionality that allows you to create fantasy in reality. Virtual Production (the ability to see virtual 3D content through the camera lens while shooting) has become a standard tool in many big movie productions these days. 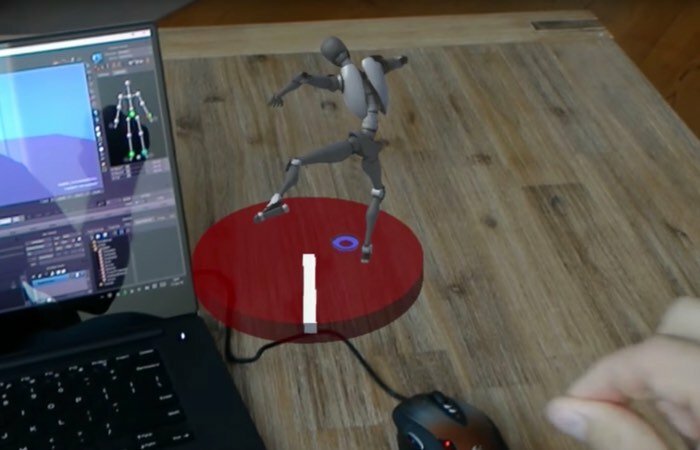 – This early prototype shows how to live stream a 3D character with motion capture data into the Microsoft HoloLens from Autodesk Motionbuilder [a popular professional 3D character animation tool], using a simple WiFi connection. Prototype showing live streaming of motion capture data from Autodesk MotionBuilder on the laptop into the Microsoft HoloLens over WiFi. The idea behind it is to give visual effects supervisors and movie directors the ability to see virtual characters on their movie set while walking around and without the need for looking through a camera/tablet screen. While at the same time providing them with a toolset for manipulating the virtual assets with software the crew is already familiar with.